Playsuit: Urban Outfitters Shirt: H&M Coat: Monki Scarf: Edinburgh Woollen Mill Shoes: New Look Bag: Urban Outfitters Jewellery: H&M/Accessorize/Can't remember! I feel like I haven't blogged an outfit post in such a long time, actually began to miss it! How crazy is it that December is just around the corner, feels like Halloween was only the other day! I really love this playsuit and felt annoyed at myself that it was only ever being worn on nights out as there was just way too much skin on show for a normal day at Uni, so I wore my white shirt underneath, also added a little bit of warmth! I feel like I've fallen off the face of the blogging world a little bit, and have been making sure to catch up on my favourite blogs this week. It's funny how much i've grown to love my blog in such a short space of time, and how it's become such an important part of my life! Soppy bit over, I promise! I've seen that some of the Christmas lists have been popping up on some blogs, might have to do mine at some point! What sort of things do you think you'll be asking for this year? The thought of Christmas shopping at the moment is pretty daunting, but I'm going to make sure that I don't leave it as late this year as usual, otherwise i'll be running around the shopping centre's, going just a tad loopy! I've been thinking about doing 'Questions & Answers' in an upcoming blog, so if you have any questions you would like to ask me, feel free, I can't wait to see what you want to know! Right, now back to the essay writing about crime in the Wild West, and the evolution of the Conservative Party, wish me luck! this outfit is an absolute dream - this is an outfit i would happily wear/own myself. gorgeous, i'm genuinely inspired by how wonderfully put together this is. i know what you mean on the blog front, i love my wee wordy world a lot. good luck with the essays.. one word related thing i'm not entirely fond of. Love the idea of you wearing a shirt under an item that would usually only surface by night - might give that one a go myself! I love how you've layered the playsuit with such a cute blouse.. what a great idea miss Murray Mint! Such a lovely outfit, love the shirt under the playsuit. love love love this outfit! might have to steal it off you! 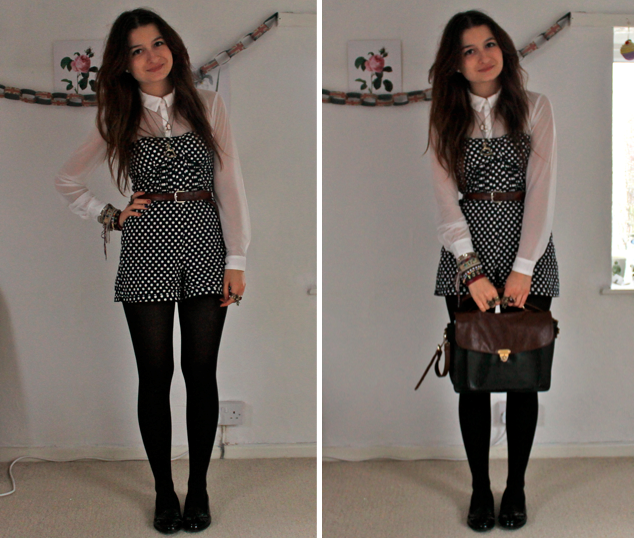 I love the way you've put the shirt and playsuit together i would of never thought of that and it's worked so so well!